YUCa's Japanese Cooking aims to give people from all over the world an opportunity for experiencing Japanese culture through cooking and food. Our cooking classes are directed in English and focus on Japanese home meals that are eaten everyday or seasonally at home. 1. Local supermarket tour - After we meet at the station, we directly visit the supermarket. We will buy the ingredients together and learn about Japanese food in there. 2. 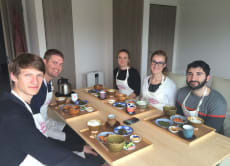 Japanese Home Visit - Every class is held at Yuka's private kitchen! We'll show you the unique cooking machines and tools. Welcome! 3. Simple, Easy and Good Quality - We strongly take care to introduce the simple and easy (also TASTY!) authentic Japanese Home Meals. We also teach you the the Japanese soup stock "Dashi", secrets and tips so that you can cook at your home kitchen for many times! I believe that our cooking class experience would be one of the best precious souvenirs for you, your friends and families forever!